Traveling for work usually involves bringing along a small mountain of electronics, each with cables that need to tag along too. But a new Kickstarter promises to replace them all—power, video, and audio—with a single multi-headed cord that can handle any connection that wireless hasn't already replaced. 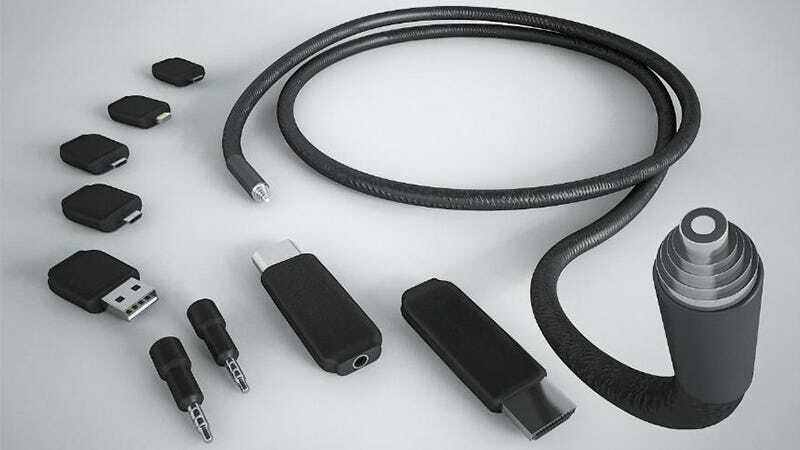 Universal cables with swappable connectors aren't a new idea—there are countless smartphone chargers that can easily be converted from Lightning to microUSB to Apple's old dock connector by simply swapping in a new head. But what sets the TOB apart is that it claims to transfer data, audio, video, and power. Inside the nylon-wrapped cable are a combination of heavy gauge copper wires surrounding an optical fiber core. How exactly those are laid out is presumably the secret sauce to what makes the TOB capable of handling different tasks. And to make the cable easy to use, the TOB's creators claim its round design allows for the connectors to be attached in any orientation—they don't need to be perfectly lined up to work. So how the TOB can be used as an HDMI cable—which has 19 pins that need to be perfectly aligned—is a bit of a mystery. The TOB cable has already reached its $20,000 funding goal on Kickstarter, and despite claiming far more functionality than other supposed 'premium' cables, you can pre-order a five-foot version for $65 with delivery as early as July. And that includes Lightning, microUSB, miniUSB, regular USB, audio, HDMI micro, and standard HDMI connectors.